It was the third consecutive loss for a candidate Trump had supported – and the second in Alabama’s Senate race alone. Luther Strange, Ed Gillespie, and now Roy Moore have all lost crucial races within the past three months despite having the president’s backing. 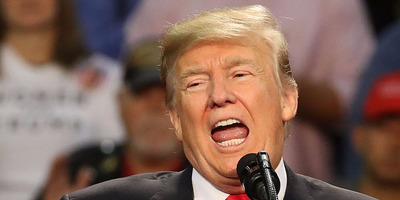 President Donald Trump suffered yet another major political defeat Tuesday night in deep-red Alabama – his second loss in one Senate race alone and the third consecutive loss for a candidate he had thrown his weight behind. In Tuesday’s special election for the US Senate seat vacated by Attorney General Jeff Sessions, the Republican candidate Trump supported, Roy Moore, lost to the Democrat Doug Jones by about 1.5 points. And though Moore faces allegations that he pursued sexual relationships with teenage girls as young as 14 when he was in his 30s, Trump publicly supported him in the campaign’s final weeks. 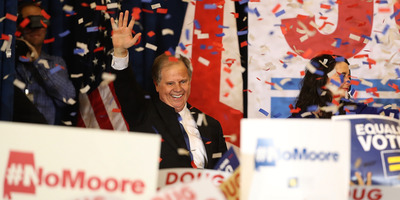 But that didn’t help push Moore over the edge in one of the most Republican states in the nation – one the president won by nearly 30 points in the 2016 election. It also wasn’t the first time Trump’s preferred candidate lost in Alabama. During the GOP primary, Trump threw his support behind the incumbent, Republican Sen. Luther Strange. But Moore easily defeated Strange in the runoff in September – more than a month before The Washington Post first reported on the allegations against Moore. Days before that report, the Democrat Ralph Northam crushed the Trump-backed GOP nominee Ed Gillespie in Virginia’s gubernatorial race. Trump was the only major elected Republican to provide Moore such full-throated support in the campaign’s waning days. “Trump was the one who got Jones within firing range, and Moore allowed Jones to win,” Kyle Kondik, a political analyst at the University of Virginia’s Center for Politics, told Reuters,adding that Democrats have shown higher levels of enthusiasm in each of this year’s elections because of Trump. Of course, Trump’s record in 2017 isn’t all losses. Republicans won each of the contested special House elections, the biggest being Karen Handel’s victory in June over the Democrat Jon Ossoff in Georgia’s 6th Congressional District; Trump had supported Handel. “If last night’s election proved anything, it proved that we need to put up GREAT Republican candidates to increase the razor thin margins in both the House and Senate,” Trump tweeted Wednesday morning.